I woke up feeling really, really sick yesterday. I haven't felt that completely unwell in quite a while. Because I knew I wasn't contagiously ill, and because I am stubborn and my criteria for staying home sick are rather high, I still dragged myself to school and class and participated, but it was really a struggle at some points. In truth though, like most Tower events, the getting sick thing was probably a rather necessary reminder/message from my body to my brain. I haven't really been on top of things recently in terms of taking care of myself physically as well as I should, and well: all actions have consequences, and all that. 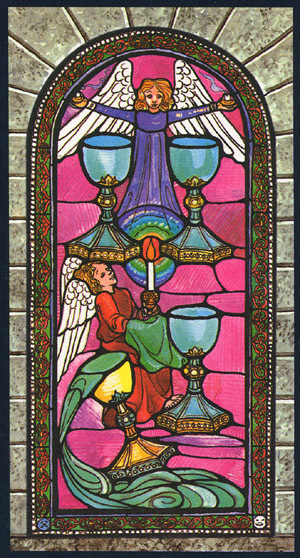 There's a lot of background to that, and not all things I can really or fully or immediately change, but I think this 4 of cups, which came up with my second tower draw, offers a useful message. Sometimes it's really just about doing what you can to make the best of things. Making a conscious effort not to get sucked into the mindset of 'If I can't fix everything, why bother?' In truth, even small steps in the right direction can make tangible, positive improvements in your life. Here we have the two angels, one of them holding up that candle, the other presiding over or perhaps blessing the cups. There is a nice, warm pink background to everything. And yes, one of those cups isn't upright, is spilling out, and perhaps that is a rather serious problem. What really strikes me about the scene though, is how unbothered the angels are by it. So it goes. Sometimes things don't work out. Sometimes plans don't unfold the way you thought they would. Sometimes, despite your best efforts, you fail, cannot do or make yourself stop doing something. Sometimes a tower event -large or small - appears and suddenly everything seems a jumbled mess. But what good is it, to dwell on the spilled cups, to nurture (fours, that empress association) negative emotions like frustration, disappointment, hopelessness, helplessness. Better, instead, to focus on making the best of things, in whatever way - again, small or large - that you are able. Hey Bonkers - hope you are feeling better today. It's no fun being ill without someone to wait upon you hand and foot! 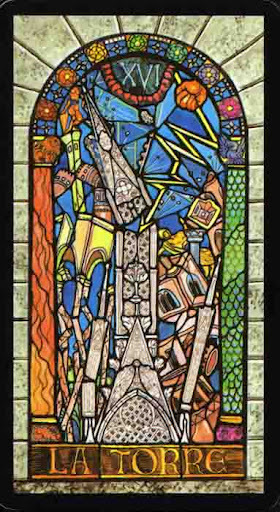 I too love the stained glass effect in the card - beautiful.